Bolo ties emerged in the 1940s to challenge the conventions of men's neckwear and to show off the informal ruggedness of the West in stylish, highly ornamental ways. Native american jewelers and silversmiths in particular brought artistry to this wearable art form. The bolo tie, also called a bola tie, is a western necktie consisting of a braided leather cord with an ornamental clasp. While the exact orgins of the bolo tie remain uncertain, there are obvious visual connections with Victorian-era metal-chain necklaces as well as Great Plain Indian neck ornaments incorporating central shell or metal medallions. The more obvious antecendent is the metal scarf slide worn by both Anglo and Native american men of the same period. The 1930s-40s find Zuni Pueblo artisans fashioning beaded scarf slides, and with Navajo, Hopi, and Zuni silversmiths creating small bolo ties from silver in isosceles trapezoid or keystone shapes. Diversity of techniques, materials, and designs transformed the modern bolo tie into a canvas on which to feature elements of texture, surface, color, and form. The contemporary Indian jewelery movement, beginning in the mid-twentieth century with Hopi artist Charles Loloma, introduced unusual techniques, nontraditional materials, and new designs, all reflected in these bolo ties. 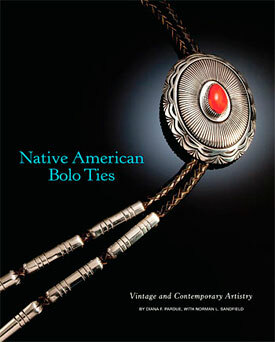 This publication is the first to showcase a wide variety of Native American-made bolo ties produced in the Southwest over the past sixty years.